Pomegranates are best known for their ability to improve arterial health. The challenge is that, while adding polyphenol-rich foods to our diets is beneficial, it doesn’t always provide enough polyphenols to exert a meaningful effect on prevention.6 That’s where pomegranate extracts may play a crucial role. The most promising studies on pomegranate’s anti-cancer actions are on its ability to slow the progression of prostate cancer. These studies offer evidence of pomegranate’s ability to slow down the progression of prostate cancer. While most of the clinical studies on pomegranate’s anticancer benefits have been conducted in men with prostate cancer, the encouraging results can be expected to translate to other malignancies as well. In fact, numerous animal and basic lab studies have now added to our understanding of pomegranate’s promise in cancer prevention. One of the first questions about any natural compound (or drug, for that matter) is how well it is absorbed after oral intake. It is also important to determine how much of the compound ultimately reaches its target tissues (glands, organs, etc.). 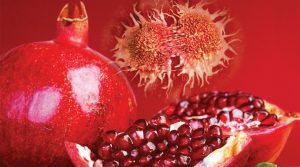 Supplementation with three specific compounds found in pomegranate—luteolin, ellagic acid, and punicic acid—has also been shown to inhibit the progression and spread of prostate cancer in animals injected with human tumor cells.14 In this study, pomegranate supplementation inhibited the growth of the primary tumor, and also shut down biochemical signaling pathways required for metastasis. As a result, none of the implanted tumors metastasized. This is a tremendously important finding, especially considering the terrible prognosis in humans when metastasis occurs. Many fast-growing tumors can be induced in small animal models by treating them with known cancer-causing chemicals. This is a technique that is commonly used in studying cancers of the colon and digestive tract. Such cancer-inducing treatment leads to the development of early precancerous lesions known as aberrant crypt foci in colon tissue, which represent areas of abnormal cell replication and growth in the folds of tissue that line the intestine.15 If left untreated, aberrant crypt foci have a high likelihood of progressing to intestinal polyps, and then to fully-developed cancers. Studies have also indicated pomegranate’s protective effect against cancer in patients with inflammatory bowel diseases. Chronic intestinal inflammation is a known precursor of intestinal malignancies, which is why inflammatory bowel diseases such as ulcerative colitis and Crohn’s disease substantially increase the risk of such cancers. One reason why pomegranate extracts have demonstrated potent effects against a variety of different types of malignancies is because they mount a multitargeted attack against cancer cells. Cancer is a complicated, multifactorial disease, with no single cause and no likely single cure. Because of that, cancer prevention strategies are most effective when they simultaneously address the many underlying causes of cancer in a multitargeted fashion. This is what makes natural compounds such as pomegranate so appealing for cancer prevention. Unlike synthetic molecules, natural compounds—especially polyphenols—are capable of a multitargeted effect because they operate within the same complicated set of rules and events that cancer itself plays by. Pomegranates contain a host of protective molecules that benefit not only the plant, but those who consume it. While these constituents are best-known for reducing the risk of heart disease, they are now also being explored for their ability to help prevent cancer. Because cancer is a multifactorial disease, any compound aimed at preventing it should have multitargeted effects. This is a virtue of the active constituents of pomegranate fruit, skin, and even leaves. Lab studies show that pomegranate extracts exert at least seven distinct beneficial effects that confer protection to cells against malignant changes, while making those that do mutate less likely to progress. Animal studies help corroborate that pomegranate supplementation can reduce the incidence of cancers, slow their growth, and reduce the size and number of cancers that develop. Human studies indicate that pomegranate extracts are capable of slowing the progression of prostate cancer. Additional research findings indicate pomegranate’s potential benefits in breast and colon cancer as well. Pomegranate’s multitargeted properties make it an ideal chemoprevention supplement, one that is widely available and potent in its effects. Given its cardioprotective effects, pomegranate extracts offer a well-rounded approach to protecting against some of today’s deadliest diseases. Gonzalez-Sarrias A, Gimenez-Bastida JA, Garcia-Conesa MT, et al. Occurrence of urolithins, gut microbiota ellagic acid metabolites and proliferation markers expression response in the human prostate gland upon consumption of walnuts and pomegranate juice. Mol Nutr Food Res. 2010;54(3):311-22. Nunez-Sanchez MA, Garcia-Villalba R, Monedero-Saiz T, et al. Targeted metabolic profiling of pomegranate polyphenols and urolithins in plasma, urine and colon tissues from colorectal cancer patients. Mol Nutr Food Res. 2014;58(6):1199-211. Nunez-Sanchez MA, Karmokar A, Gonzalez-Sarrias A, et al. In vivo relevant mixed urolithins and ellagic acid inhibit phenotypic and molecular colon cancer stem cell features: A new potentiality for ellagitannin metabolites against cancer. Food Chem Toxicol. 2016;92:8-16. Syed DN, Chamcheu J-C, Adhami VM, et al. Pomegranate Extracts and Cancer Prevention: Molecular and Cellular Activities. Anticancer agents med chem. 2013;13(8):1149-61. Adhami VM, Khan N, Mukhtar H. Cancer Chemoprevention by Pomegranate: Laboratory and Clinical Evidence. Nutrition and cancer. 2009;61(6):811-5. Nunez-Sanchez MA, Gonzalez-Sarrias A, Romo-Vaquero M, et al. Dietary phenolics against colorectal cancer–From promising preclinical results to poor translation into clinical trials: Pitfalls and future needs. Mol Nutr Food Res. 2015;59(7):1274-91. Turrini E, Ferruzzi L, Fimognari C. Potential Effects of Pomegranate Polyphenols in Cancer Prevention and Therapy. Oxid Med Cell Longev. 2015;2015:938475. Available at: http://www.cancer.gov/about-cancer/diagnosis-staging/diagnosis/tumor-markers-fact-sheet. Accessed August 12, 2016. Pantuck AJ, Leppert JT, Zomorodian N, et al. Phase II study of pomegranate juice for men with rising prostate-specific antigen following surgery or radiation for prostate cancer. Clin Cancer Res. 2006;12(13):4018-26. Paller CJ, Ye X, Wozniak PJ, et al. A randomized phase II study of pomegranate extract for men with rising PSA following initial therapy for localized prostate cancer. Prostate Cancer Prostatic Dis. 2013;16(1):50-5. Seeram NP, Aronson WJ, Zhang Y, et al. Pomegranate ellagitannin-derived metabolites inhibit prostate cancer growth and localize to the mouse prostate gland. J Agric Food Chem. 2007;55(19):7732-7. Rettig MB, Heber D, An J, et al. Pomegranate extract inhibits androgen-independent prostate cancer growth through a nuclear factor-kappaB-dependent mechanism. Mol Cancer Ther. 2008;7(9):2662-71. Sartippour MR, Seeram NP, Rao JY, et al. Ellagitannin-rich pomegranate extract inhibits angiogenesis in prostate cancer in vitro and in vivo. Int J Oncol. 2008;32(2):475-80. Wang L, Li W, Lin M, et al. Luteolin, ellagic acid and punicic acid are natural products that inhibit prostate cancer metastasis. Carcinogenesis. 2014;35(10):2321-30. Waly MI, Al-Rawahi AS, Al Riyami M, et al. Amelioration of azoxymethane induced-carcinogenesis by reducing oxidative stress in rat colon by natural extracts. BMC Complement Altern Med. 2014;14:60. Banerjee N, Kim H, Talcott S, et al. Pomegranate polyphenolics suppressed azoxymethane-induced colorectal aberrant crypt foci and inflammation: possible role of miR-126/VCAM-1 and miR-126/PI3K/AKT/mTOR. Carcinogenesis. 2013;34(12):2814-22. Waly MI, Ali A, Guizani N, et al. Pomegranate (Punica granatum) peel extract efficacy as a dietary antioxidant against azoxymethane-induced colon cancer in rat. Asian Pac J Cancer Prev.2012;13(8):4051-5. Bishayee A, Mandal A, Bhattacharyya P, et al. Pomegranate exerts chemoprevention of experimentally induced mammary tumorigenesis by suppression of cell proliferation and induction of apoptosis. Nutr Cancer. 2016;68(1):120-30. Marin M, Maria Giner R, Rios JL, et al. Intestinal anti-inflammatory activity of ellagic acid in the acute and chronic dextrane sulfate sodium models of mice colitis. J Ethnopharmacol.2013;150(3):925-34. Dassprakash MV, Arun R, Abraham SK, et al. In vitro and in vivo evaluation of antioxidant and antigenotoxic potential of Punica granatum leaf extract. Pharm Biol. 2012;50(12):1523-30. Forouzanfar F, Afkhami Goli A, Asadpour E, et al. Protective Effect of Punica granatum L. against Serum/Glucose Deprivation-Induced PC12 Cells Injury. Evid Based Complement Alternat Med.2013;2013:716730. Zahin M, Ahmad I, Gupta RC, et al. Punicalagin and ellagic acid demonstrate antimutagenic activity and inhibition of benzo[a]pyrene induced DNA adducts. Biomed Res Int. 2014;2014:467465. Albrecht M, Jiang W, Kumi-Diaka J, et al. Pomegranate extracts potently suppress proliferation, xenograft growth, and invasion of human prostate cancer cells. J Med Food. 2004;7(3):274-83. Asmaa MJ, Ali AJ, Farid JM, et al. Growth inhibitory effects of crude pomegranate peel extract on chronic myeloid leukemia, K562 cells. Int J Appl Basic Med Res. 2015;5(2):100-5. Lee ST, Lu MH, Chien LH, et al. Suppression of urinary bladder urothelial carcinoma cell by the ethanol extract of pomegranate fruit through cell cycle arrest and apoptosis. BMC Complement Altern Med. 2013;13:364. Li Y, Yang F, Zheng W, et al. Punica granatum (pomegranate) leaves extract induces apoptosis through mitochondrial intrinsic pathway and inhibits migration and invasion in non-small cell lung cancer in vitro. Biomed Pharmacother. 2016;80:227-35. Grivennikov SI, Greten FR, Karin M. Immunity, Inflammation, and Cancer. Cell. 2010;140(6):883-99. Costantini S, Rusolo F, De Vito V, et al. Potential anti-inflammatory effects of the hydrophilic fraction of pomegranate (Punica granatum L.) seed oil on breast cancer cell lines. Molecules. 2014;19(6):8644-60. Kim H, Banerjee N, Ivanov I, et al. Comparison of anti-inflammatory mechanisms of mango (Mangifera Indica L.) and pomegranate (Punica Granatum L.) in a preclinical model of colitis. Mol Nutr Food Res. 2016. Neyrinck AM, Van Hee VF, Bindels LB, et al. Polyphenol-rich extract of pomegranate peel alleviates tissue inflammation and hypercholesterolaemia in high-fat diet-induced obese mice: potential implication of the gut microbiota. Br J Nutr. 2013;109(5):802-9. Kiraz Y, Neergheen-Bhujun VS, Rummun N, et al. Apoptotic effects of non-edible parts of Punica granatum on human multiple myeloma cells. Tumour Biol. 2016;37(2):1803-15. Naiki-Ito A, Chewonarin T, Tang M, et al. Ellagic acid, a component of pomegranate fruit juice, suppresses androgen-dependent prostate carcinogenesis via induction of apoptosis. Prostate. 2015;75(2):151-60. Dana N, Javanmard SH, Rafiee L. Role of peroxisome proliferator-activated receptor alpha and gamma in antiangiogenic effect of pomegranate peel extract. Iran J Basic Med Sci. 2016;19(1):106-10. Wang Y, Zhang S, Iqbal S, et al. Pomegranate extract inhibits the bone metastatic growth of human prostate cancer cells and enhances the in vivo efficacy of docetaxel chemotherapy. Prostate. 2013. Kapoor R, Ronnenberg A, Puleo E, et al. Effects of Pomegranate Juice on Hormonal Biomarkers of Breast Cancer Risk. Nutr Cancer. 2015;67(7):1113-9. Mandal A, Bishayee A. Mechanism of Breast Cancer Preventive Action of Pomegranate: Disruption of Estrogen Receptor and Wnt/beta-Catenin Signaling Pathways. Molecules. 2015;20(12):22315-28. Ming DS, Pham S, Deb S, et al. Pomegranate extracts impact the androgen biosynthesis pathways in prostate cancer models in vitro and in vivo. J Steroid Biochem Mol Biol. 2014;143:19-28. Vini R, Juberiya AM, Sreeja S. Evidence of pomegranate methanolic extract in antagonizing the endogenous SERM, 27-hydroxycholesterol. IUBMB Life. 2016;68(2):116-21.